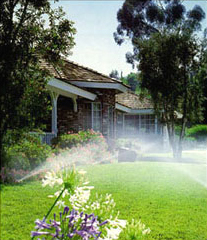 TradeWind Irrigation: Inground Sprinkler Specialists - Spotless installations that are designed for minimal disturbance of your property. It's like they were never there. Our installations are designed for minimal disturbance to your property. In most case the installation takes one day, with a minimal amount of disturbance. TradeWind installations are very neat. When the installation is complete, your home's interior and exterior are left spotless. We pride ourselves on quality, which encompasses top-notch workmanship and materials, a clean work environment, and the best service on the industry. TradeWind Irrigation heat shrinks and uses double stainless steel clamps on all connections to guarantee that your system absolutely will not leak. You just won't get this kind of installation if you have a landscaper install your irrigation system. "I wanted to surprise my husband, who loves our lawn and garden, with a Father's Day present of an inground sprinkler system. I called TradeWind Irrigation and arranged for them to do an installation before he was expected home at 3:30 in the afternoon." "I left to go to work, intending to come home at 3:00 PM to be home in time to surprise my husband with the new system. When I arrived home, I panicked, as there was no visible sign that anything was installed. I immediately telephoned Gary Krom in the office and asked if they had been unable to install the system for some reason." "Gary told me that the crew had finished the installation and, if I needed anything they could return quickly to help me with any problems. When the crew came back, they showed me the control panel and explained the system for me. They had installed the system so perfectly that the lawn and garden had no bumps, no holes, no trenches and no disturbances, whatsoever. The area around the control panel was neater than I had left it." "My husband was wonderfully surprised by the gift. I was wonderfully surprised with how clean everything was." Let us quote your system today! Simply give us a call at 860-563-9028 and we will get you started. Protect your backflow preventer from freezing! If it is late in the year and your sprinkler system needs to be shut down, it is the time to call TradeWind Irrigation at 860-563-9028 for an appointment. We have created two videos to help you avoid a frozen system and expensive repairs. Please see this link.